A salmonella outbreak at a peanut plant unfortunately has scared people into not buying peanut butter. When Soozi McLain, director of physical therapy at St. Mary’s Home for Disabled Children, recently read an article about how this has depleted supplies of peanut butter — a much-needed staple — at food banks, she knew she had to do something about it. Soozi and the PT Department at SMHDC have just finished up a peanut butter drive at the Home. They collected 61 jars of the gooey stuff to drop off at the Foodbank of Southeastern Virginia. Community service is nothing new to PT. The department has been involved in many projects, including adopting a family for the holidays, collecting money for mosquito nets to help stop the spread of malaria in Africa and coordinating the donation of platelets by St. Mary’s staff to the Red Cross every three months. 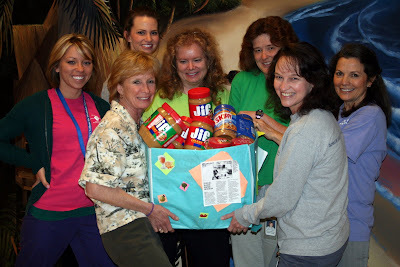 In the photo, Soozi McLain, left and Anne Freeman, right, hold the peanut butter collection box while surrounded by some PT staffers: from left, Nicole Ellis, Jennifer Reasor, Kathy Brobst, Barbara Graeff-Taylor and Rebecca Lowrance. PT staffers not pictured: Lynn Regna, Rhonda Bailey, Judy Peltz and Jackie Reese. Will Sessoms, who was elected mayor of Virginia Beach last fall, toured St. Mary’s Home for Disabled Children today with his wife, Bev. His Honor got a firsthand look at areas including the school classrooms, Early Intervention Program classroom, occupational and physical therapy departments and the children’s rooms. “I love what you all do,” Sessoms said. 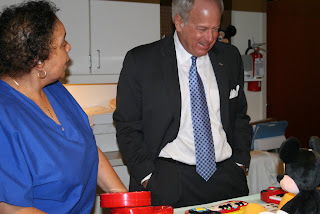 In this photo, Mamie McCloud shows the mayor some of the toys that the occupational therapy department adapts with switches to make them user-friendly for children with disabilities. There’s a new man at the helm of the Board of Trustees of St. Mary’s Home for Disabled Children. He’s Richard N. Knapp, chief operating officer for Virginia International Terminals, Inc. The Board selected Knapp last night during its annual meeting, which featured remarks by the Honorable Ralph S. Northam, senator from Virginia’s 6th District and a pediatric neurologist. Knapp succeeds Michael P. Cotter, who served as president for two years and will remain on the Board. Cotter is a partner with the law firm of Vandeventer Black in Norfolk. The Board of Trustees of St. Mary’s Home for Disabled Children will hold an Annual Meeting & Dinner at the Home on March 26. The Honorable Ralph S. Northam, a doctor and senator from Virginia’s 6th District, is scheduled to speak. The event is made possible through the generosity of two companies with close ties to SMHDC: Paul Finch & Associates, P.C. and S.B. Ballard Construction Company. Architects PF&A designed SMHDC’s state-of-the-art, 88,000-square-foot facility, which opened in February 2005. S.B. Ballard was the general contractor for the project. The next Family Night will be April 26. Stay tuned for details.